Outback Steakhouse is celebrating Fall Racing with a new Sweepstakes in 2017. 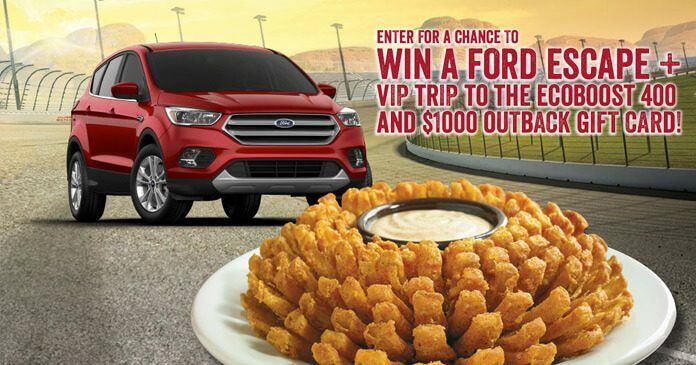 Go to outbackracing.com now and enter for your chance to win a Ford Escape plus a VIP trip to the EcoBoost 400 and a $1000 Outback gift card. The Outback Steakhouse Fall Racing Sweepstakes 2017 is open only to legal residents of the 50 United States and D.C. who are 18 years of age or older at the time of entry (19 or older if a resident of Alabama or Nebraska). The Sweepstakes begins at 12:00:01 a.m. EDT on September 19, 2017, and ends at 11:59:59 p.m. EDT on October 31, 2017. Limit one entry per person/household/email address per day, regardless of the method of entry. A random drawing will be conducted on or about November 7, 2017, to select the winners of the prizes described below from among all eligible entries received during the Sweepstakes Period through both entry methods combined. The Grand Prize winner will receive a 2018 Ford Escape SE, a VIP Race Weekend to the Homestead-Miami Race on November 19, 2017 and a $1,000 Outback Steakhouse Gift Card. The Approximate Retail Value of the Grand Prize package is $34,000. Each First Prize will consist of two (2) tickets to a race of winner’s choice at one of the International Speedway Corporation Tracks during the 2018 season and a $100 Outback Steakhouse Gift Card. Each Second Prize will consist of a Outback Prize Pack that includes one of each of the following: Hat, Tumbler, 1:64 diecast car and a Bloom Card. For the names of the winners, send a self-addressed stamped, #10 envelope to: Outback Steakhouse 2017 Fall Racing Sweepstakes Winners List Request, P.O. Box, 834, Lombard, IL 60148-0834. Winners List will be sent after the winners are confirmed and the prizes are awarded. Requests for Winners List must be received by December 29, 2017. Outback Steakhouse of Florida, LLC, 2202 N. West Shore Blvd. 5th Floor, Tampa, FL 33607.